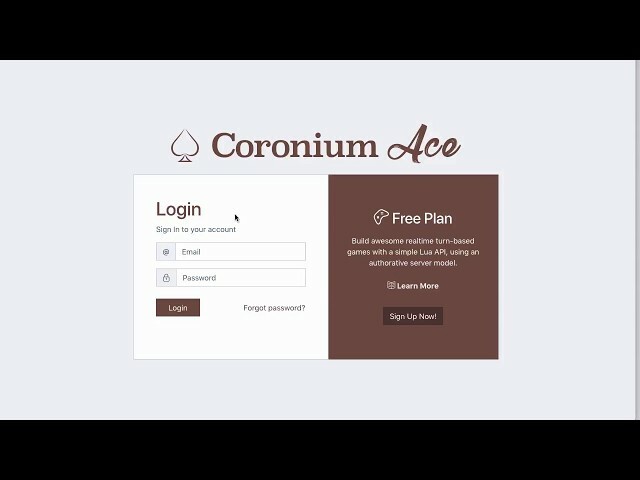 Use Coronium Ace to build awesome realtime turn-based multiplayer games with a simple Lua API, using a customizable authoritative server model, and the power of Corona. Coronium Ace includes a fully visual browser based admin to manage games, view statistics, edit your game API code with a robust code editor, and more. With the Coronium Ace service, you're in control of your game data and logic in an authoritative manner, with an easy to use turn-based multiplayer service for Corona developers. Coronium Ace is currently in private beta. Get an invite by clicking here.